I woke this morning looking for my best friends, my walking poles, but they were not to be seen. Then I remembered arriving at the pub yesterday and after another big day, dumping all my stuff out the front while I sorted out a room. I remember taking my pack up but leaving my poles near the door of the main bar and there they stayed. I must have passed them half a dozen times last night as I was in and out for handles of Tui. Luckily, someone had found them on closing and put them behind the bar for safe keeping. I was able to collect them when the pub started opening. Phew!! Was not looking forward to forking out for new ones, particularly given I was so attached to these – they have served me well. They almost have names. I’m sure one is Irish. It keeps talking to me in an Irish accent 🤔. Waiting around for opening meant a bit of a later start but that was fine. I was able to roll with the punches and take today as it comes. Today was sort of open ended as I didn’t really have a destination other than to position myself for a low tide crossing of the Okura river tomorrow morning. From Puhoi, the current official TA route requires a 7km kayak down the Puhoi River to the Wenderholm Regional Park. To kayak however requires an outgoing tide and it wasn’t expected until around 2 in the afternoon. I had two options. 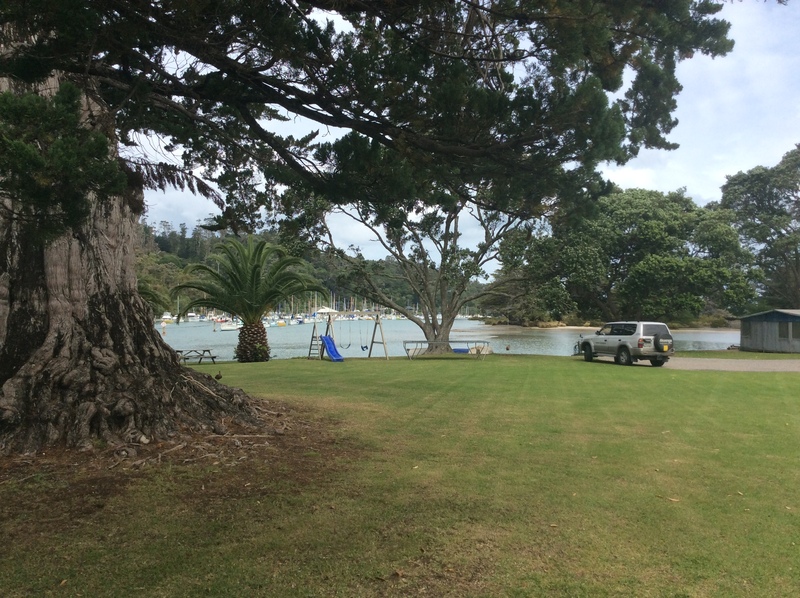 I could have a relaxing day, wait for 2pm, do the kayak and get a bit more trail time in during the late afternoon, possibly to the end of the Orewa beach; or option two, hitch around the river section straight to the park and the trail. I chose option two to get some distance in and one step closer to Auckland. Leaving the pub and heading across the road to look for a ride I ran into Vicky who camped nearby and was on the hunt for coffee and a relaxing start to the day. Good choice. She was running with the kayak option. We had a quick catch up. Turns out she wasn’t far behind me in the Dome forest and camped out on top of the other high point on the range. I walked just out of Puhoi to the main state highway and had a ride within 5 minutes of sticking my thumb out. An older guy in a BMW comlete with plush leather interior pulled over (actually he drove past, did a u-turn over double lines, and u-turned again to roll up besides me), started rearranging stuff from the front seat to the back. I asked him if he really wanted me in there, being tramper trash and all. I didn’t want to soil anything. He had no worries. Said he was a tramper and climber himself and only too pleased to help. So a short ride later and I was at Wenderholm. 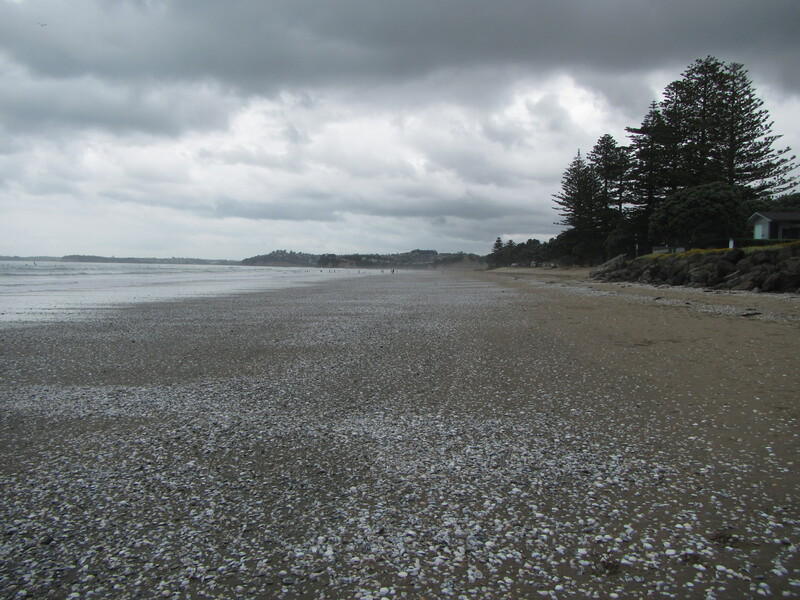 The tide was low and it was easy walk following park tracks and beach to Orewa. It was love at first sight with Orewa. It had a really good vibe and was the perfect sized town to live in. It had everything you need plus more and well situated outside the hustle and bustle of Auckland. It was a rocking spot for stand up paddles boards in the soft surf. I’ve never seen so many in one spot. 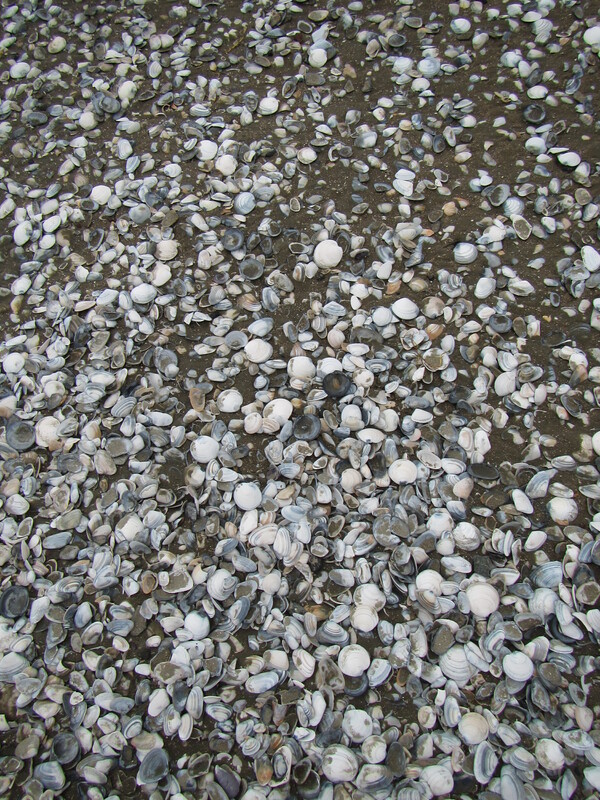 The tide way out, exposed the sand and a covering of shells. They crunched under foot with each step down the beach. Off the beach and under the bridge the next 3km was on a walkway around the estuary. Very popular with joggers and walkers out for daily exercise. I eyed up many of the nice houses and manicured gardens right on the edge of the walkway. There is some money invested in these. Great views for sure and easy walking access to town for the residents but way out of my price range. Still nice to see how the other half live. Once around the estuary it was back onto the roads and essentially walking through suburbs and industrial areas until out to the rolling hills south of Orewa. The walking was hard again. Tight turns and minimal verge down towards the Stillwater Boat Club. It was in a park just across the road from a caravan park on the water edges, I just got off a skype chat with Jacinta and was just about to start the next section of trail. I knew I was not going to cross the Okura River until the morning and was going to walk the next 4km to a section of trail to a bush block and stealth camp; it would only take an hour, when more generous Kiwi support reached out to me. The holiday park owner was driving out, came over to me and said “You crossing the river tomorrow?” Me: “Yeah mate.” Owner: “Low tides about 9:30am. Stay here. I don’t charge Te Araroa Walkers. I’m heading into town for an hour but chill out in the common room. There’s mattresses in there, thrown one down on the floor tonight. I’ll given you a token for the shower when I get back.” Me:”What! That is too much. I have to at least give you koha.” Owner:”Nah. Everyone else gets charged but no charge for you guys. We need to look after you. Besides you never need much, just a place to sleep, cook and a shower is always nice.” Awesome! And so I find myself enjoying yet more kiwi hospitality. A free nights camping in a gorgeous area right on the water. With low tide at 9:30am it is the perfect spot to relax for the afternoon. If I leave at 7am and get the four kilometres in, it will set me up perfectly to cross the Okura right on low tide.